DO-17101-44 was succesfully added to your cart. All calibration certificates contain as-found and as-left data, estimated measurement uncertainties (emu’s) and test uncertainty ratios (TUR’s) at no additional cost! NIST-traceable calibration allows you to confirm that the specific asset you purchase does in fact meet the manufacturer’s published specification. Receive your product calibrated and ready to use rather than sending it to a third-party or internal calibration lab and incurring additional delays. EPA, USDA, ISO and GLP/GMPs standards require regular NIST-Traceable calibration of all test equipment being used in critical applications. Measurements reported on our reports are traceable to SI units via national standards maintained by NIST and are performed in compliance with MIL-STD-45662A, ANSI/NCSL Z540-1-1994, Appendix B, ISO9002-94, and ISO/IEC 17025:2005. The results stated in our reports relate only to the items tested or calibrated. 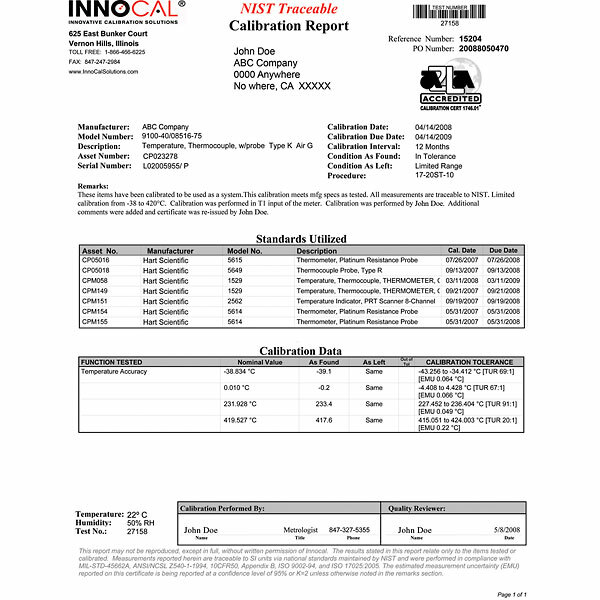 Calibration reports issued by InnoCal may not be reproduced, except in full, without written permission of InnoCal. We can calibrate most makes and models of light meters including AEMC, Amprobe, Extech, Konica Minolta, Lutron, and Sper Scientific, from 0 to 1000 foot candles or 0 to 20,000 lux. Our standard is housed in a state-of-the-art light meter calibration laboratory - designed to provide the light-controlled conditions needed for the most accurate assessment of your luminance meter. Can you carry out a calibration test on my PCE-174 Data logger light meter and provide a calibration certificate? If so can you advise cost, timescales and delivery return procedures? Yes, we can calibrate this instrument. Please contact us by telephone to arrange the service. This part number (17101-44) is for the calibration, so the price should be correct on this page for the service. What is the normal frequency of calibration for a white light meter. Are there National documents specifying recommended frequencies? Generally, NIST does not set the calibration schedule. Those are generally set by the regulations you must follow. If not told, our lab defaults at a 1 year calibration schedule. I suggest checking with the specific manufacturer of the light meter if they have any suggestions as well. Is your lightmeter calibrations performed at three points and accurate to within +or- 5% of standard? Would it be serialized, stickered and identifiable to calibration data? The unit calibration data would reference the model and serial number of the unit that was sent in. We perform a 6 point test and the best uncertainty for illuminescsence 1.7% and for luminescence is 2%. The tests max out at 5000lux. Can you calibrate a TES-1331 Digital FC Meter? Yes, we can certify this meter. Can you calibrate the General make UV512C Digital UVC Light Meter in the range of 0 to 1999 nm calibration at 254 nm with traceable certificate? Currently we can only calibrate items in the visible range. Can you calibrate a Minolta ILLUNINANCE METER T-I to 99 999 lux, with 17025 accreditation and uncertainty data? Yes, item 17101-44 is for the light calibration and 17100-03 for the accreditation. Please call our customer service department for a return authorization number to send the unit in, (800) 358-5525. As this unit was sent in for one of our customers, I have to say that the turn-time and the easy of calling in and getting all the information I need is the best. Used them for a couple of years now and always get great service and quick turnaround on my instruments. The Extech Foot Candle / Lux Meter Model P401205 is relatively inexpensive and easy to use. Most ipmortantly, it is N.I.S.T. traceable. However, the coil wire at the base of the meter tends to bend and break, or short-out, necessitating repair before the annual calibration is due. Davis Instruments will not repair less tan $400, therefore we must purchase more light meters. New light meters were purchased in September 2011, December 2011, and September 2012, for this reason, because they will not last a year. The calibration has been holding within the 5 % tolerance recently, but two identical meters can be significantly different at the low end the range where we measure.